Just over seven weeks ago I made this wedding cake for one of best and oldest friends, Nic. It was very different to anything I’d made before – no fondant icing or fancy decorations, just cake and buttercream. Nic and Alex wanted the cake to be the dessert so they chose red velvet (which is also Alex’s favourite cake flavour!). Had I known that the wedding was going to be in a marquee on the hottest day of the year, I probably would have tried to suggest a different cake! Baking the cakes was probably the easiest part. The recipe is here if you want to have a go – I just scaled up the quantities for the different sized tins. It was also the messiest since I managed to stain my hands with red food colouring. I ended up making one 12″ cake, which I cut into 3 layers, two 10″ cakes cut into 3 deep layers in total (I made one deep cake which I cut into 2 layers and a shallower one which I just levelled off), one 7″ cake cut into 3 layers and two 5″ cakes, each into 2 layers. Given the heat, I decided to ice the cakes in 3 stages. Firstly I sandwiched the layers together for the bottom tier and did a thin “crumb” layer of buttercream. I put it straight into the fridge and then started on the second tier. After I’d done all 4 tiers, the first tier was ready to have another layer of buttercream added. I added a second smooth layer of buttercream to each tier and left them in the fridge to harden again. Then I added the final layer of buttercream to each tier. I wanted the bottom and third tier to be textured so I added a layer of buttercream to the whole cake and then, using a palette knife I made strokes upwards all the way round the cake and then made strokes from the outside to the middle on top of the cake. For the second and top tier I wanted them to be smooth so I just added another layer and tried to get it as smooth as possible. Assembling the cake was a nightmare. Luckily I took Becky with me to help me. The instant we walked into the marquee the heat hit us and we started dripping with sweat and the cakes started melting. I’d attempted to pre-cut the dowelling rods before we left but they weren’t all the same height so we ended up having to re-cut them on the floor in the marquee. The buttercream had started to soften up and sweat on the drive over to the venue so it was impossible to assemble to cake without damaging the buttercream. Luckily any damage to the smooth buttercream was covered up with the lace and hessian bands which Nic’s mum, Penny, made. After about an hour of wrestling with the cake in a marquee that was a like a sauna, I ended up covered in red velvet crumbs, cream cheese buttercream and sweat – not ideal when you’re dressed up ready to go to a wedding! I was dreading going back to the marquee after the wedding since I was expecting the cake to be a melted mess on the floor on the floor of the marquee. By some miracle it didn’t melt and the buttercream even hardened up again. However, there was a slight disaster – the bride and groom which I’d made to sit on the edge of the board were in pieces. I’m not sure what happened but it looked like somebody had knocked into the table. There was no way that I was going to be able to reassemble them in the position they had been in, so I improvised and sat them under the edge of the board, against the wine box and on some of the metal pots that I had made the hydrangea cupcakes in. The photo above is the only one I’ve got when the bride and groom were in the right place. You might have noticed the quality of the other photos are much better – that’s because they are the official ones. 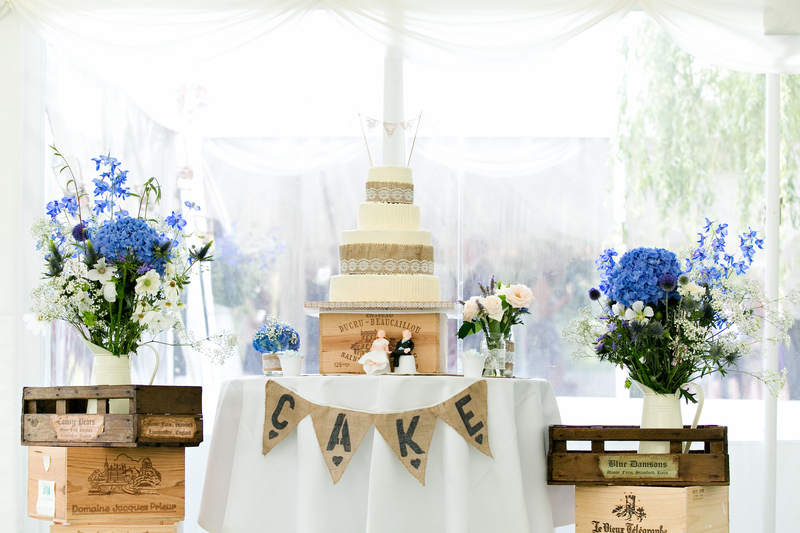 Thank you to Mike Thornton from StillVision Photography for the beautiful photos of the cake. Despite the small hiccups with the cake, the day was perfect – congratulations Mr and Mrs Wilson!